Richard Walser (1908-1988), North Carolina’s foremost chronicler of the state’s literary history, was born in Lexington of Wachovia Moravian descent. His father, a North Carolina state legislator and attorney general, influenced and fed his son’s interest in North Carolina literature. 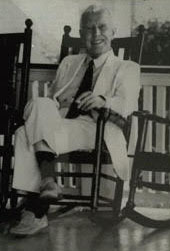 After a year at Davidson College, Walser transferred to the University of North Carolina, where he earned his bachelor’s degree in 1929. From then until 1942, he taught high school English, returning to Chapel Hill during the summers to complete his master’s degree in 1933. He published his first anthology, North Carolina Poetry, in 1941. An apocryphal story relates that at one time Richard Walser looked into doing doctoral work at Chapel Hill in North Carolina literature, and was told quite firmly that was not an acceptable subject. He was determined, despite this rejection, to pursue his interest, publishing and editing over the course of his life more than thirty books and pamphlets, including anthologies of North Carolina short fiction, humor, legends, and poetry, and Literary North Carolina, an indispensable history of North Carolina writers and writing from the days of the explorers to the 1980s. He also wrote biographical studies of Bernice Kelly Harris, Inglis Fletcher, and Thomas Wolfe, among others, and is recognized as the national authority on Thomas Wolfe. A number of his works were published by the North Carolina Division of Archives and History, and continue to be revised and reissued for use by students in North Carolina schools. As an active member of the North Carolina Library Association, North Carolina English Teachers Association, and State Literary and Historical Association, Walser was instrumental in advancing research and understanding of his native State’s culture. He also helped redefine and set standards for North Carolina’s literary awards. A fair and objective critic, he was not shy about stating negative opinions, although he did so gracefully and with humor, as in Nematodes in My Garden of Verse, an anthology of poetry gone wrong. Walser taught briefly at Chapel Hill, and spent most of his career on the faculty at North Carolina State University. A popular speaker, he lectured often at other educational institutions, as well as at civic clubs and patriotic organizations. He served on numerous committees and with organizations that contributed to the improvement of many aspects of life in North Carolina, including the Watauga Club, a publicity-shunning group of state leaders who were quite influential in charting the course of North Carolina events. Richard Walser received a number of awards, but the three that meant the most to him were a Guggenheim Fellowship in 1957, the North Carolina Award for Literature in 1976, and an honorary doctorate from North Carolina State University in 1988. Read several stories from Richard Walser’s North Carolina Legends.